From 20,000 votes we’ve made it to finalist in the Collaboration category of Cake Master Magazine Awards for our “Welcome to the Jungle” live installation at the Cake & Bake Show Manchester this year – created by all these people in this list here. Thank you to everyone who nominated us! There were some fabulous collaborations this year (and last year) and we’re delighted to be in such good company … and, let’s face it, it’s a great excuse for a knees up! 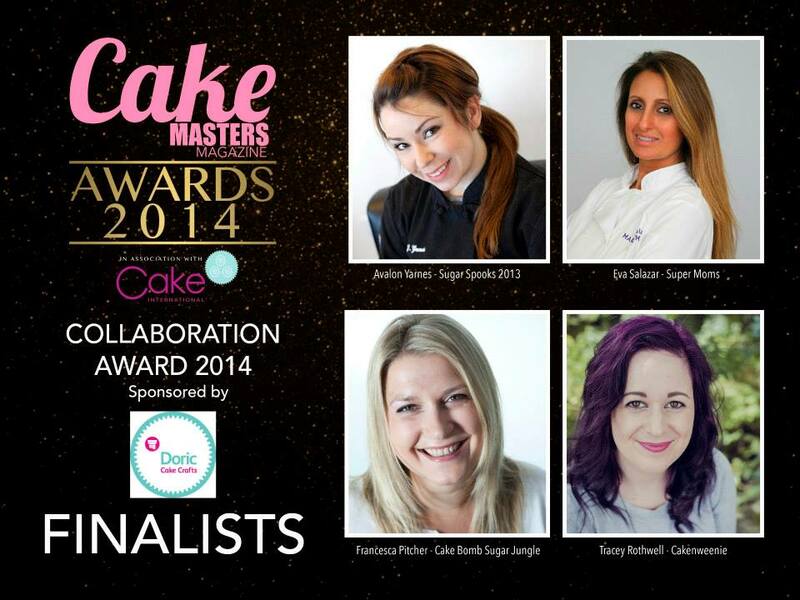 Fellow CakeBomber Tracey Rothwell of Little Cherry Cake Company is also nominated in this category for running the splendid Cakenweenie collaboration. And CakeBomber Vicki Smith of Incredible Edibles is nominated in the Novelty Cake category. Well done Vicki! 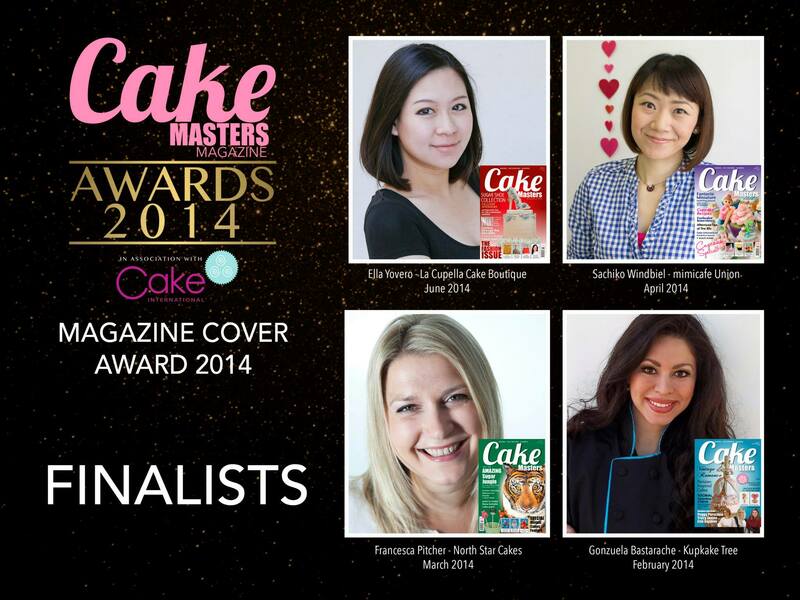 Francesca Pitcher of North Star Cakes (and CakeBomb’s artistic director) is nominated for best Cake Masters Magazine Cover image for her tiger cake. And look at that super talented Avalon Yarnes appearing twice too! Those scary Sugar Spooks are back this year too! 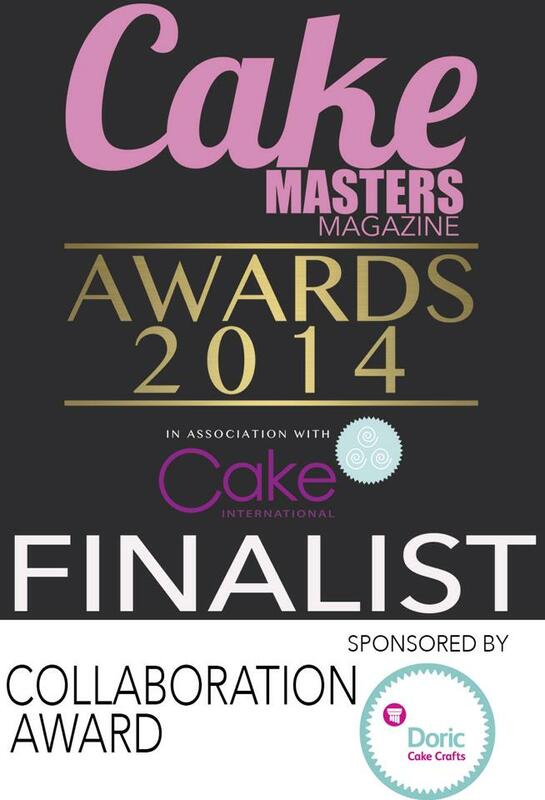 Check out the CakeMasters website to see the list of all the finalists. Good luck to all! 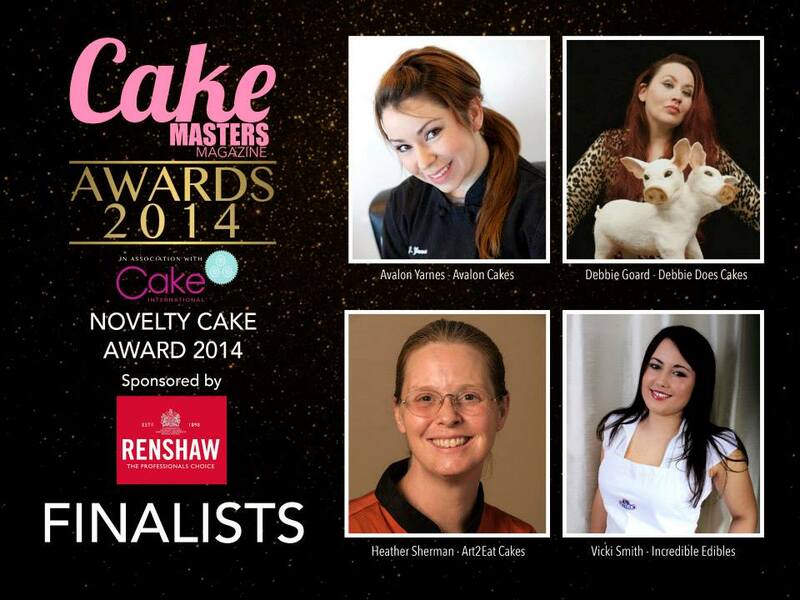 Francesca, artistic director of CakeBomb is our poster girl, alongside three other lovely ladies of course. Good luck all! Francesca again, for her Tiger cover! Good luck to all the finalists! Over the weeks we’re going to feature some of our team in a little more depth. 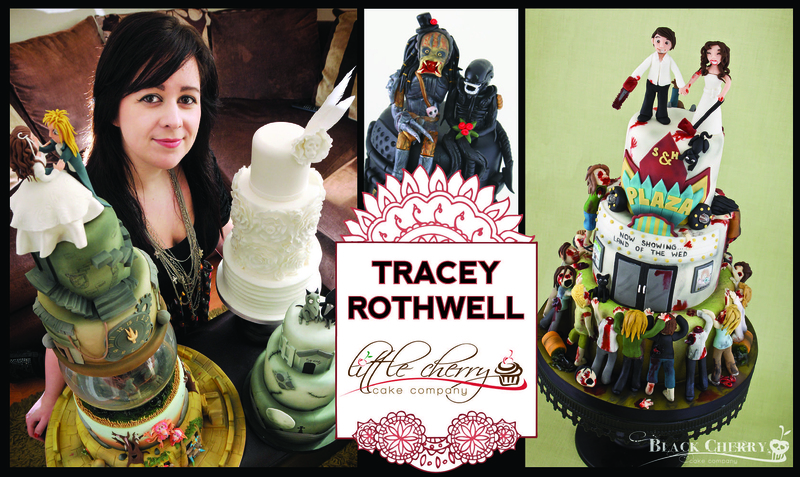 First off is a well-known face to many, who is as much at home doing pretty and stylish as she is geeky and grotesque … but we suspect we know which one she prefers 😉 … Tracey Rothwell from Little Cherry Cake Company. Tracey, tell us a bit about you. I am pretty much known for weird wedding cakes (or that’s what some people like to call them!) which often include zombies, skulls or movie characters. But I do make bright kids cakes too! You’ve been cake decorating since 2007, that’s a long time in cakeland, do you still get the same buzz each time you deliver a special cake? It is a long time! I have actually been making cakes since I was 13 years old on and off, and there is NOTHING better than a brand new theme/design to get working on! After all this time I STILL get excited when a cake order comes in with a theme I haven’t made yet, I practically sit making inaudible squeaking sounds at the computer! Hearing the gasps and giggles from customers is always awesome on collections and deliveries too, it’s what makes it all worthwhile. You run your company in two halves, Little Cherry, and Black Cherry for the darker themed cakes. Who do you think is having more fun? You really don’t need to ask 😀 As much as making bright kids cakes is REAL fun (and it really is! ), after the twentieth Peppa Pig model I really want to bust out a zombie version! And when they allow me to splatter blood on it too, I pretty much have a friend for life! What cake has been the most fun to make? I have many, many fun cakes, but one that always stands out is for the couple that came and ordered my OWN dream wedding cake! Since I started making cakes I have always wanted to do a Zombie Apocalypse style wedding cake, all climbing their way up the tiers. But one day it HAPPENED … a zombie wedding cake with a movie theatre theme. I was ALL over that one! The guys were just AWESOME, and I met up with them and spent hours just geeking out over ideas. The final design included a retro-style plaza cinema on the front being overrun by zombies, and round the back was the inside on the cinema where a Gremlin in 3D glasses was enjoying a Troma film. There was blood, guts, bodies, chainsaws, blood, rats, lights, movie posters … and MORE BLOOD. Probably many of people’s worst nightmares … but we LOVED IT! Rather than flowers you concentrated on fungus for the CakeBomb installation, what was it about those things that you enjoyed? Well I’m not going to lie, I’m not exactly known for floral stuff! So fungus was much more likely to be up my street 😉 I even got to jazz them up a bit with Bollywood style gems! I really admire people who can make realistic flowers, man that stuff is hard – I have never gotten into it properly. Last year you organised the Cakenweenie project, how was it to be involved in a project as a contributor instead of an organiser? whilst I have been messing around with mushrooms and gems in my kitchen! You have such a large portfolio of amazing work, and your competition-winning pieces always inspire other cake makers, do you enjoy seeing how others interpret your ideas? Copyright © CakeBomb, 2014. All rights reserved. Reproduction is not permitted without permission. Email us first, we're nice!